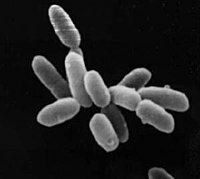 Halobacteria, tréithchineál speicis NRC-1. Tá gach ceall thart ar 5 μm ar fhad. Is éard atá i gceist leis na haircéigh ná miocrorgánaigh aoncheallacha a bhfuil cuma na mbaictéar orthu ón taobh amuigh cé nach baictéir iad. Is prócaróit iad, rud a chiallaíonn nach bhfuil núicléas ceart ná orgánaidí eile iontu a bheadh á gcoinneáil le chéile ag seicní. Ríocht iontu féin iad na haircéigh, ar aon leibhéal leis na baictéir féin. Tugadh an leathanach seo cothrom le dáta an 18 Deireadh Fómhair 2017 ag 20:21.